It's that time of year when haunted attractions start opening up all around the country. Some call themselves "extreme" haunts but what makes an attraction that extreme without actually hurting someone? This new faux documentary/found footage film begs that question when five friends hop in an RV and seek out the most extreme haunt in the country. Of course, it goes very wrong. 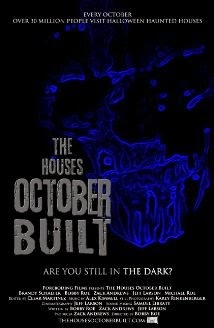 "The Houses October Built" is produced by "Insidious" and "Paranormal Activity" producer, Steven Schneider and Zack Andrews and it stars and is directed by Bobby Roe. In addition to Andrews and Roe, this indy flick stars Brandy Schaefer, Mikey Roe and Jeff Larson. According to Variety, "RLJ Entertainment and Image, which acquired North American rights last month, will distribute 'The Houses October Built' for a limited run starting Oct. 3." This actually looks promising and scary. Check out the just released trailer and let us know what you think. Also, let us know what are your favorite haunted attractions and what limits they've pushed.